Itemis-glen-4730 - Majorville Cairn south of Bassano, Alberta. Itemis-glen-4731 - Majorville Cairn south of Bassano, Alberta. Itemis-glen-4732 - Majorville Cairn south of Bassano, Alberta. Itemis-glen-4733 - Majorville Cairn south of Bassano, Alberta. Itemis-glen-4734 - Majorville Cairn south of Bassano, Alberta. Source of title proper: Title based on provenance of records. The Glenbow Foundation became interested in archaeological sites in Alberta in 1955. The Director of the Foundation was Dr. Douglas Leechman, a Canadian archaeological pioneer. An agreement was made with Dr. Hannah Marie Wormington of Denver, Colorado, USA, Dr. William Mulloy of the University of Wyoming and Dr. E. Mott Davis of the University of Texas to assemble data on the archaeological potential of Alberta. Several excavations were undertaken and a variety of early collections photographed. In the fall of 1956 the foundation hired Dr. Richard G. Forbis and an Archaeology Department was formed. 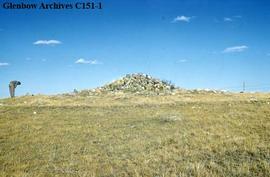 From 1957 on the department's main objective was to investigate the late prehistoric sites in southern Alberta. In the summer of 1957 Forbis, assisted by David H. Quapp and Timothy J. O'Leary, undertook excavations at Grassy Lake Cairn and the Ross Site on the Oldman River northeast of Lethbridge. In the summer of 1958 and 1959 Archaeology Department field parties, under the direction of Donald R. King, 1926-2007, Quapp, and Tyler Bastian, excavated buffalo jumps south of Calgary, especially Old Women's Buffalo Jump. Other excavations carried out in subsequent years included Cluny Earthlodge Village on the Blackfoot (Siksika) reserve, Head-Smashed-In Buffalo Jump, Castor Creek site, Rumsey cairn, FM Ranch site, British Block cairn near Medicine Hat, the Fletcher site east of Lethbridge, and the Kenney site west of Fort Macleod. Petroglyphs were also discovered and studied at sites including Writing-On-Stone Park and Zephyr Creek. In 1963 the Archaeology Department's attention turned to historic sites and the fur trading post of Rocky Mountain House was excavated under William Noble of the University of Toronto. Dr. Brian O.K. Reeves led a field party in excavations around Alberta in 1964. Dr. Forbis joined the University of Calgary as a professor in 1965, and was a founder of the University's Archaeology Department in 1966. After Forbis' departure, Don King headed the Glenbow Foundation Archaeology Department until it closed in 1969. For further information see An Introduction to the Archaeology of Alberta, Canada / H.M. Wormington and Richard G. Forbis. - Denver, Colorado : Denver Museum of Natural History, 1965. These records were transferred to the Archives from the Archaeology Department in 1968. The fonds consists of slides and photographs of archaeological sites, excavations, field camps and artifacts from Glenbow Foundation Archaeological Department surveys and excavations in Alberta, and of private artifact collections. Also includes correspondence, site survey work sheets and reports, field notes, manuscripts, articles and papers related to the department's surveys and excavations. Includes recording of an archaeological convention held by the Glenbow Foundation (1960), radio broadcast by Don King on Alberta archaeology (1962) and scrapbook on archaeology in Alberta. RECORDS RELATED TO THE FOLLOWING SUBJECTS ARE ALSO IN THIS FONDS. SEE INVENTORY FOR DETAILS: Jane Askey, bison, William Byrne, Castor Creek site, Crystal Spring site, Armin Dyck, Clive Elliott, Sandy Ervine, A.M. Erwin, funeral rites and ceremonies, Ron Getty, J. Hubert, Russell Johnson, H.P. Lewis, pottery, E. Richards, Norman Richards, Royal Ontario Museum, Maynard Shute, Kenneth Smith, J.A. Spencer, stone circles, and tipi rings. The original negatives and archaeological collections are held by the University of Calgary.